We want to support you in looking after your physical, mental and emotional health and wellbeing; they are all connected and equally important. University life is exciting, stimulating and hard work. We know that life as a student can sometimes bring a set of unique challenges and that life outside of university can sometimes be just as demanding as your studies. Our team is here to support you when you need it, and to help you get the most out of your time at university. 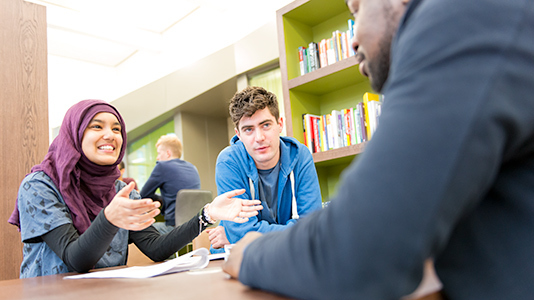 We’re available to all LSBU students and offer a confidential and collaborative space to discuss what’s on your mind. If you’ve applied to study at LSBU and think you’d benefit from finding out more about the kinds of support available please get in touch for a pre-enrolment meeting by emailing studentwellbeing@lsbu.ac.uk or phoning 020 7815 6454. Visit us in the Student Life Centre or find out more about our team on our student portal MyLSBU. We strongly advise students to register with a doctor as soon as you enrol so that you can obtain immediate medical advice and assistance if you fall ill or have an accident. Information on registering with a local GP is available on the NHS website and provided during Welcome Week. The closest GP surgery to the Southwark Campus is Princess Street Surgery. For dental care you’ll need to register with a local dentist. Search the NHS website for local NHS dentists. For advice email studentlife@lsbu.ac.uk or call 020 7815 6454. We recommend that all students are vaccinated against Meningitis and Measles, Mumps and Rubella (MMR). All new university students up to the age of 25 are being offered free Men ACWY vaccine to prevent illness caused by the four different strains of the meningococcal bacteria that cause meningitis and blood poisoning (septicaemia). Meningitis is rare but it is a serious disease which can easily spread among students living in close proximity. The advice is for all new university entrants to be vaccinated with the Men ACWY vaccine before starting university. For more information about meningitis, including a symptoms checker and a mobile app, visit Meningitis now. International students are advised to get immunised in their home country before the start of university. Please ask your doctor / nurse for the Men ACWY vaccine. What happens if you’re not immunised before the start of university? If you are entitled to free medical treatment on the NHS you may be eligible to receive the vaccinations. These are available from your local UK doctor – you should register with your local doctor as soon as possible. If you are not entitled to free NHS treatment, you can get vaccinations from a local travel clinic which you may need to pay for. There are a number of faith based societies running through LSBU’s Students’ Union. These include the Christian Union, Islamic Society and the Hindu Society. For the latest information on these and all societies visit the Students' Union website.